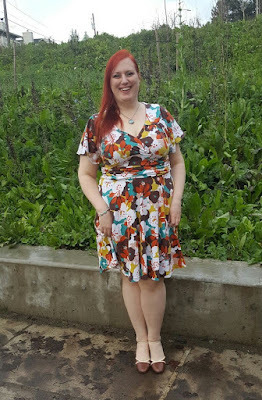 I cut this lovely dress out over a year ago, and I had finally started sewing it in August, but I had to put it on hold because I was missing a couple pieces and then I was chosen to participate in the Fabricista Fashion Challenge 4. This is as far as I got before I put it on the back burner. The pattern is (OOP) Butterick 5243 and I picked view A with the lovely flutter sleeves. 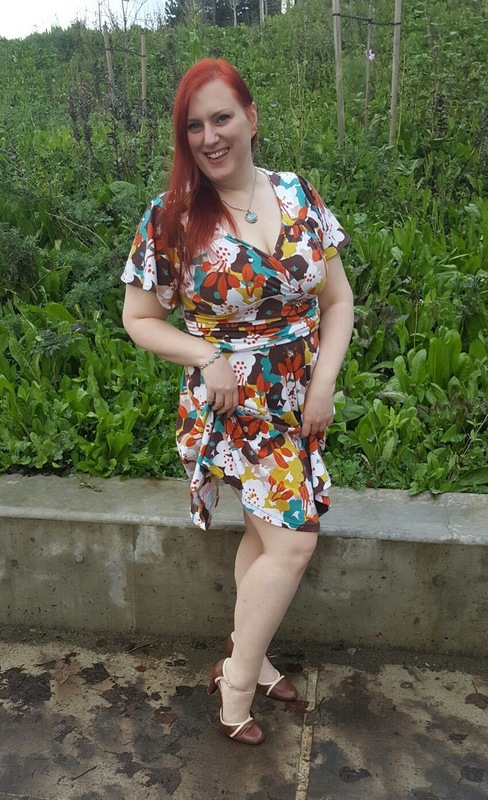 The fabric is a Mustard/Brown/Teal/Multi Abstract Floral Jersey Knit that I bought from Fabric Mart in May of 2015. 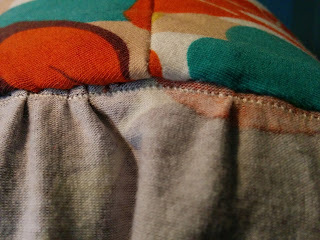 The back of the fabric is soft and flannel like and I just love the way it feels, as well as how it looks. 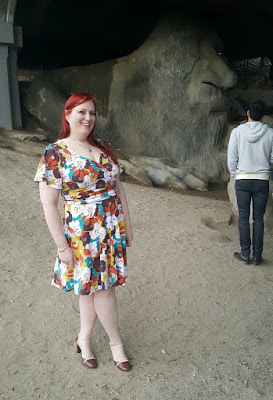 We went to the Fremont Troll to take these photos because I thought it would be fun to start adding a little bit more of the Seattle experience to my blog. 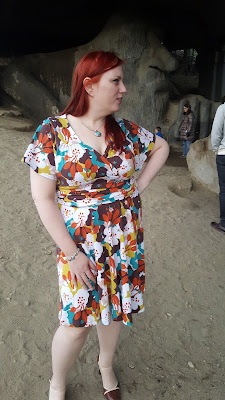 Plus, we were headed to Fremont to go to our favorite conveyor belt sushi place for lunch anyway, so it was only a couple blocks out of our way. Well, I forgot how popular the Troll is, so we took most of our photos in the area next to the troll since it was people free and there was a lovely green background. We got some with the Troll in the background too, but it was near impossible to not have other people in the photos, so not many of those came out very well. Oh well, interesting idea, but it didn't pan out like I'd hoped. The photo above led to my favorite photo. My daughter was my photographer and I was playing up the pinup girl feeling I have wearing this dress by lifting my skirt to show a little more leg and my daughter said "Oh, those gams!" and that made me laugh, which she captured so well. I didn't make any alterations to the pattern, but I made one small change to the construction process. When I went to add the waistband to the bodice, the front cross over was still all open. So, instead of properly matching the notches to make the crossover, I wanted to make sure the bodice wasn't dangerously low and I could wear it without worry. So, I tried it on and got the crossover the way I wanted it and basted that together. Then, as I was attaching the waistband, I just gathered it at the underbust to make it fit. 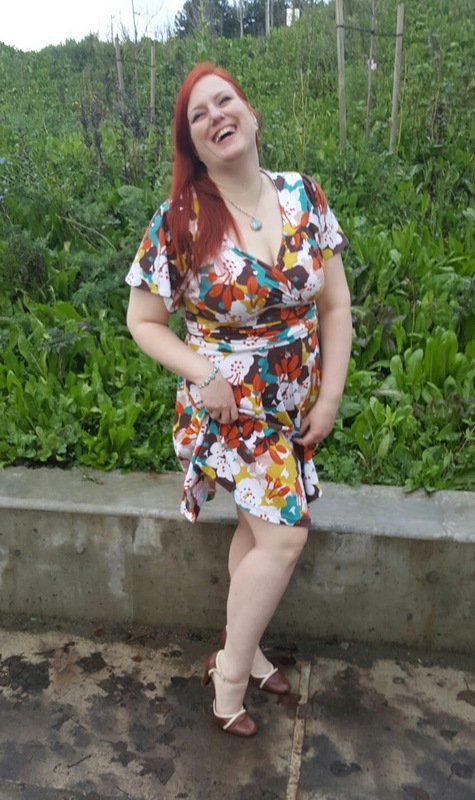 So, I think I don't have quite as much gathered as the example photos because my front pieces overlap more than they are supposed to, but it fits perfect right now and shows just the right amount of cleavage. 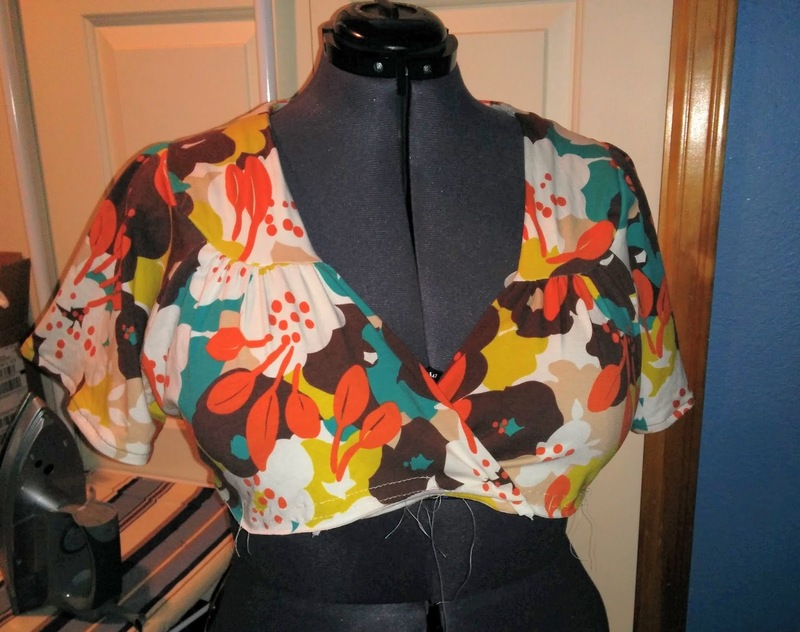 I also hand sewed the neckline facing to the seam allowance of the yoke. I used to hate hand sewing, but I totally didn't mind doing it the last couple times and I think it made the neckline turn out much nicer than if I'd tried to sew it down by machine. Overall, I really am very pleased with how this dress turned out. I do wish I'd gone with the long sleeve version, simply because both times I wore it, I was chilly and ended up wearing a jacket over it, so a lot of the nice details were hidden. My daughter liked this photo because she said I was making the same face as the Troll. It was not intentional on my part at all, but I can't help but agree with her!